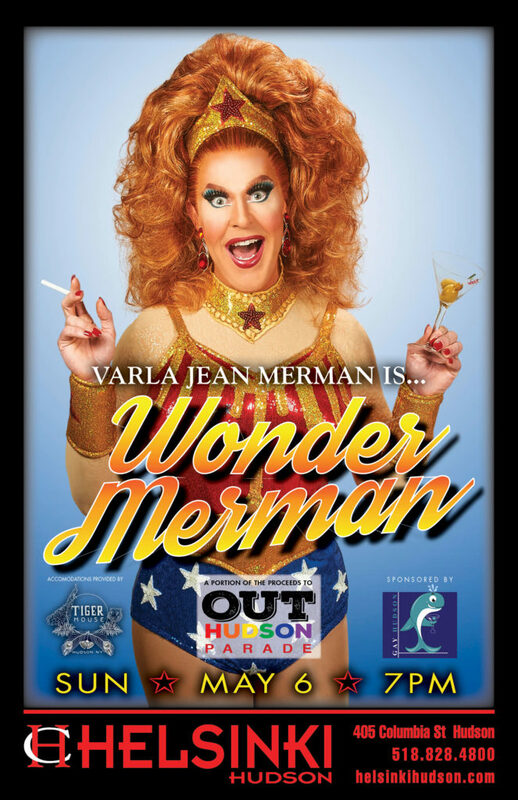 Varla Jean Merman comes to Hudson as Wonder Merman! THANK YOU to our accommodations sponsor – The Tiger House in Hudson! As Varla Jean, Jeffery Roberson has filled cabarets and concert halls across the world including the Sydney Opera House, Carnegie Hall, the New York Public Theater, London’s Soho Theatre and LA’s Renberg Theatre. Jeffery wrote and starred in the short Improve Your History with Varla Jean: Stonewall, for the launch of the MTV’s television network Logo and was also seen in their One Night Standup: Dragtastic special. Jeffery has starred as Varla in numerous TV and stage roles as well, with highlights that include Project Runway, Ugly Betty, and the film Girls Will be Girls. Varla Jean Merman’s new show – Wonder Merman – pays tribute to the inspiring women who have inspired her to think about becoming inspirational. Don’t miss this special one night only opportunity to see Varla in Hudson this year!